She holds a BA degree from the University of Idaho and a MFA degree in printmaking from the University of Montana. 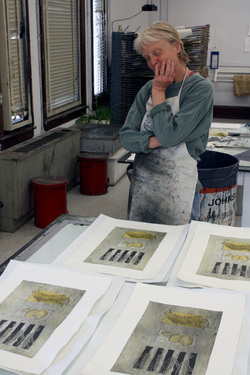 The current body of mixed media works employs a variety of printmaking techniques (relief, intaglio, collagraph, transfers, stencil), along with drawing and collage materials, including various rice papers, tissue paper, vellum, etc. Much of my work is based on ideas of survival and transformation, focusing on the simple yet complex nature of organisms and how species evolve and exist. I’m interested in exploring the impact of human relationships, as well as natural processes, on the natural environment. The work is largely informed by my living environment, having resided in the western U.S. for most of my life, and an awareness of the profound changes that have, or have not, occurred in my lifetime. I am drawn to the use of multiple images that printmaking offers. By making numerous small plates, I'm able to carry through with a continuity of imagery and ideas in my studio. The processes of ordering and arrangement, patterning, and surface- layering are integral to my work.